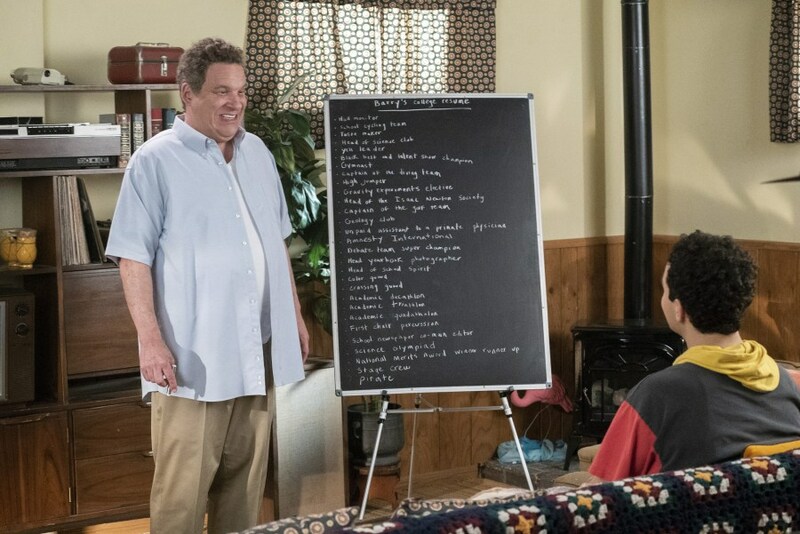 This week on the Goldbergs, Beverly tries to pursue her dream of being a lawyer (which she practically is already! ), and Barry tries to get into college now that his relationship with Lainey is over. Barry is freaking out because everyone else has been preparing for college while he hasn't. Murray offers to help him find a school, but Barry picks a school at random and he decides to apply to it. After being injured in a car crash, Beverly decides to request a stop sign to city hall, and she asks Adam to help with it. She goes to the comptroller, not fully understanding what he does, and she and Adam present their video to him. The video is confusing, but the comptroller grants the stop sign. This goes straight to Beverly's head and convinces her to become a lawyer. Murray advises Barry on his college resume, telling him to stretch the truth to make it more impressive, no matter how insane it sounds. After learning how to become a lawyer, Beverly decides not to become one after all, because she "already kinda is" one. Barry's fellow JTP members get angry when he tells them about his lies on his resume, which makes him rethink it. Meanwhile, Erica reveals to Beverly that she's given up on her dream of becoming a rock star. Murray tells Barry that a Tufts alum is at the house to talk about his resume, and during the interview, Barry admits that he lied on the resume. Beverly tells Erica that, because of her urging, she has a new dream: writing a cookbook. She also encourages Erica to give her music dream another try. After reading Barry's real essay, Murray tells him that getting into college isn't more important than his happiness and that he's proud of his growth. This was a solid episode, but I can't help but feel like it left something to be desired. It had plenty of funny moments in it, for sure, but I just didn't enjoy it as much as I've enjoyed most of the episodes this season. It was definitely one of their weaker outings, because both of the plots felt incredibly familiar. While I still enjoy the show, it's gotten very predictable as of late and I need something them to shake things up a bit. This episode was pretty much just business-as-usual, and the best they can go for with that approach is an average episode. The episodes may be funny, and the actors may give it their all, but the underlying feeling of familiarity always hurts it. However, I did enjoy seeing Beverly find a new passion, and her new goal of writing a cookbook should provide for some unique storylines in the future. Murray bonding with Barry was very sweet, but we've seen similar endings to Murray/Barry plots before and that makes the moment less emotionally impactful. All in all, this episode could have been a lot better, but still gave us some strong moments and the ending of Beverly's plot gives me hope for the future of the show.